HUNTSVILLE — As winter continues — despite Wiarton Willie’s prediction of an early spring — provincial police would like to pass on some safe winter driving tips. First (a few from us) is to turn on your full set of lights during the day — something you should do anyways at all times. You’re easier to see from behind — before you apply your brake lights. And keep a safe distance. Don’t cut in front of vehicles just because there is space. Don’t hog the passing lane, give way to traffic behind. When passing, be very careful, especially around transports and trucks. If you can, early in a snowfall use all the lanes and don’t create a convoy in just one lane. The more use of all lanes makes it easier for everyone. 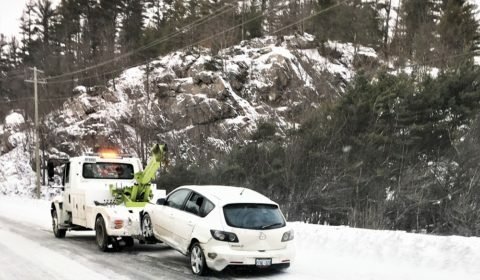 How to avoid this – white winter tow and go – from Friday afternoon south of Gravenhurst on NB Hwy. 11. Prepare yourself for safe winter driving by planning your trip before starting out. Or visit the Ministry of Transportation of Ontario website for road conditions at Ontario 511. Always dress for winter even though you will be the car. Carry a fully-charged cell phone to contact emergency services if you experience trouble. And carry a survival kit in your vehicle, even if it seems unnecessary. Recommended items include a shovel (you should already have), blanket, booster cables (remember them? ), flashlight (and extra batteries), high energy foods (don’t eat them all), matches and a candle (believe it or not lighting it works). Make sure your heater and defroster are working properly, check all lights including hazards to ensure they are working. Clear your car of all snow and ice (something you should do all the time), fill up windshield washer fluid (keep extra in vehicle), and keep your fuel tank at least half full (if not full). In bad weather if you do not need to travel stay at home. If you do need to drive please adjust your driving accordingly. Allow extra time travelling to and from destinations and slow down. Leave ample space between yourself and the car in front of you. If you experience trouble, if possible, park your vehicle well off the roadway and stay in vehicle until help has arrived. It’s safest to have your vehicle’s full lighting system on at all times for best visibility, especially if snow blocks your tail lights.